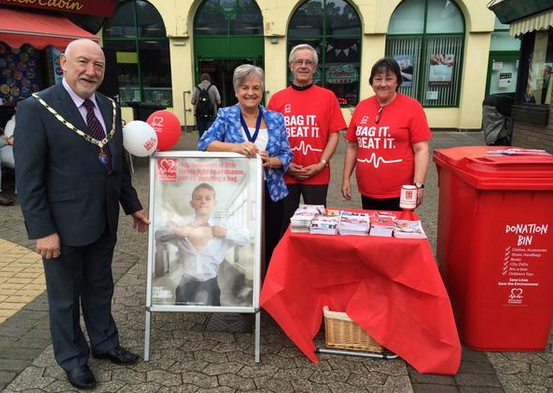 Market Walk Shopping Centre joined forces with British Heart Foundation (BHF) shops to launch their ‘Bag It. Beat It.’ campaign, which urged the Newton Abbot community to donate bags full of unwanted items. Every bag donated helped fund life-saving heart research, helping over 40,000 little heroes continue to fight congenital heart disease. Before the BHF was founded, only one in five babies born with congenital heart disease saw their first birthday, let alone their first day of school. Thanks to pioneering research, now around 4,000 children are able to experience their first day of school every year. Filled bags can continue to be donated to Bag It. Beat It. at the local BHF shop. Shoppers can fill a bags with unwanted clothes, shoes, books, handbags, DVDs, CDs, bric-a-brac and children’s toys then take it to drop point in the local BHF shop. “The Bag It. Beat It. event is such a great idea and proves the perfect opportunity to sort out the cupboards and give away items that you no longer want or need. We’re delighted to be involved and look forward to welcoming local children to the centre to donate bags of items to show their support for the little heroes who have congenital heart disease. For more information, to find your local BHF shop or to arrange a free collection, visit bagit.bhf.org.uk.